What are the different ways to measure fetal heart rate? The three most common methods to measure and monitor the fetal heart rate (FHR) are by using either a handheld fetal Doppler ultrasound device, also known as intermittent auscultation, by electronic fetal monitoring, or by use of a special stethoscope. Electronic fetal monitoring, either internal or external, measures both the FHR and the contractions of the mother, and records the results continuously, in graphical form. Electronic fetal monitoring can be used both externally or internally; internal fetal monitoring of the FHR is an invasive procedure and requires attaching a spiral electrode to the baby’s scalp. Using a stethoscope, on the contrary, is much simpler and less invasive, and is typically used after about the 30-week gestation period. 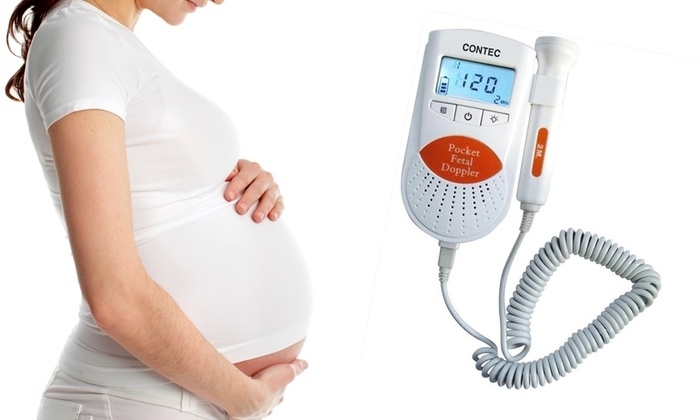 A fetal Doppler is a non-invasive monitoring device used to measure the fetal heart rate of babies, before delivery. 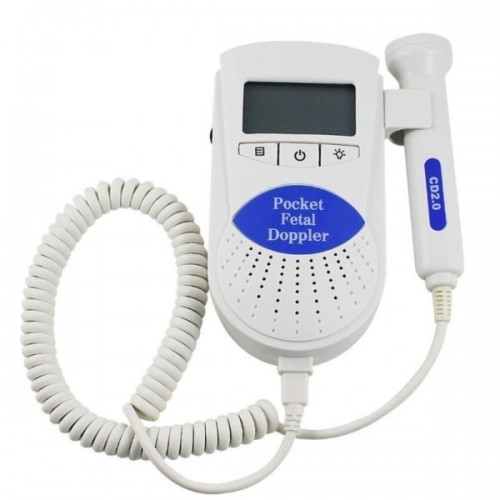 The portable handheld Doppler is a convenient device that uses the principle of the Doppler Effect to record and measure the FHR through an external, non-invasive way. The fetal heart Doppler works by means of emitting and receiving continuous ultrasound waves, and then registering the shift in frequency and wavelength. For example, imagine you are driving, and you hear the sirens of a police car behind you. As the police car gets closer to you, the sound will increase, and as it gets farther and farther away, the sound will decrease. The same principle is used by a fetal Doppler. In this case, the moving object, instead of being the police car, is the fetal heart. As the distance between the probe and the fetal heart becomes closer, the baby’s heartbeat will become louder. What are the different kinds of fetal Dopplers? There are two main types of fetal dopplers: audio-only fetal dopplers and digital fetal dopplers. Audio-only fetal dopplers allow you to listen to the heartbeat of your baby, while digital fetal dopplers, in addition to allowing you to listen to your baby’s heartbeat, have a digital display of the baby’s heartbeat. What kind of probes are fetal Dopplers equipped with? Each ultrasonic Doppler is equipped with a 3 MHz or a 2 MHz probe, which is waterproof. The higher frequency probe will produce shorter wavelengths than the lower frequency one. The results of millions of tests prove that 3 MHz works better than the lower frequency option during pregnancy. However, in some rare cases where the expectant mother is overweight, the lower-frequency 2 MHz probe has been shown to be more effective. Lie down and expose your abdomen fully. Add ultrasound gel on the lower part of the abdomen, as well as on the probe, to reduce static and popping noises. Before turning on the fetal Doppler monitor, place the Doppler probe on your abdomen. This will help reduce the amount of static when turning the monitor on. Move the probe around the abdomen until you hear a heartbeat. Normally, the fetal heart rate can be detected from 8-12 weeks in pregnant women. The fetal Dopplers can detect maternal sounds and placental sounds, which comes as a result of blood flow from the expectant mothers. The average normal range of the FHR is between 120BPM-180BPM. In many cases, it is normal for the fetal heart rate to reach as high as 190 BPM, and the data may vary within a reasonable range. The calculation of the baby’s heartrate is simple and users can set and count any interval of time and then multiply that number to get the final results. For example, if you count 10 heartbeats over a period of 6 seconds, multiply the number of beats by 10 (6 seconds x 10 seconds equals one minute) to get a total of 100 beats per minute (10 heartbeats x 10 = 100 bpm). Now more and more expectant parents are choosing to rent or purchase a reliable FDA-approved ultrasound fetal Doppler for home monitoring and reference. For more questions and concerns about this device, please consult your healthcare provider. Looking to buy a fetal doppler? Hearing the sound of your baby’s heartbeat is priceless, and now for a limited time you can save 80% on a fetal Doppler. To purchase, click here, “add to cart”, and follow the on-site prompts. If you have any questions, please do not hesitate to give us a call at 1-888-769-4827.